Trial Victory Forces Insurance Company to Cough Up Fair Settlement. Sometimes the best negotiating tool in settlement discussions is take the case to trial. Our client Alberto Jijon worked for a company called M&M Interiors that was hired to perform drywall work on a construction project, which involved the expansion of a plant where nutritional bars were manufactured. Shortly before his accident, Mr. Jijon and his co-workers were installing drywall in an electrical room, which included drywall over a framed-out doorway. On several occasions, M&M’s foreman asked the general contractor on the project to install a door in that area so that workers could safely enter and exit the electrical room. The general contractor’s project superintendent, however, denied this request because he had scheduled a city building department inspection for the following day and believed that he needed to completely seal off the electrical room in order to pass the fire code inspection. In short, the general contractor sacrificed worker safety in order to save time and money. After M&M had sealed off the doorway on the general contractor’s orders, the only way for workers to access the electrical room was to grab a pole and swing themselves over a wall, with a drop off of over 15 feet. While performing this maneuver, Mr. Jijon lost his balance and fell, landing on his head. He sustained permanent brain damage with cognitive problems. He was in a coma for several days and spent over three weeks in the hospital. Due to his brain injury, he will require help with activities of daily living for the rest of his life and will likely never work again. 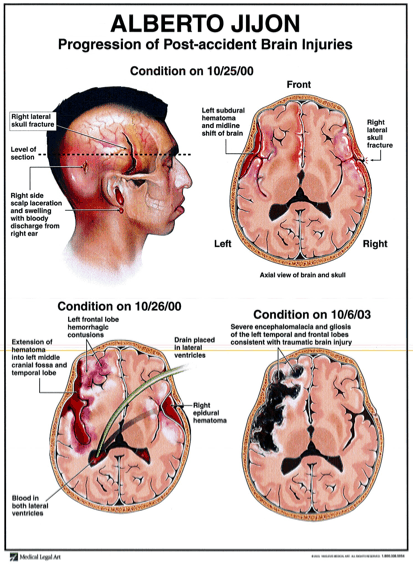 We used the medical illustration below to demonstrate to the jury the nature of Mr. Jijon’s injury. We filed suit against the general contractor and learned that it had a $2 million insurance policy. After taking depositions of the key witnesses, we demanded that the insurance company pay the $2 million. It refused and offered next to nothing. The case proceeded to trial, which was bifurcated between liability and damages. This means that the trial would be divided into two parts. In the first part, the issue would be whether the general contractor caused the accident, and the parties would present evidence on that issue. If the jury then decided that the general contractor was responsible, we would proceed to the second part, where the issue would be the extent of Mr. Jijon’s injuries and how much money it would take to fully compensate him. During the liability phase of the trial, the insurance company offered $450,000 to settle the case, which we rejected. At the end of this phase, the jury returned a verdict in favor of Mr. Jijon, and we began putting on evidence concerning Mr. Jijon’s injuries. Then, with the moment of truth even closer at hand, the insurance company finally agreed to settle the case for $1.9 million – almost their entire policy. Yet it had required taking the case almost to the end of trial to show the insurance company what the true value of the case was. With this settlement, Mr. Jijon has been able to pay for the medical care and other help that he requires in order to live a relatively normal life.